This year's Million Marijuana Marches got underway last weekend in towns and cities around the world. Though because of scheduling issues, this year many marches will not take place until this weekend, the first round of marches and demonstrations suggest that the movement continues to expand. But that expansion is uneven. In some places, notably Rio de Janeiro and Buenos Aires, the pot culture ran up against ugly social realities or intransigent local officials, while in other places, especially staunchly prohibitionist Sweden, the movement emerged publicly for the first time. 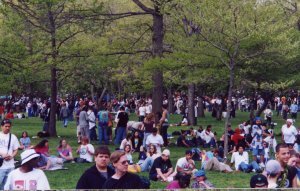 Now in their fourth decade, the Million Marijuana Marches are coordinated by long-time marijuana (and ibogaine) activist Dana Beal and his group Cures Not Wars (http://www.cures-not-wars.org), who not only take responsibility for organizing the New York City march but also act as a clearinghouse for activists from around the world planning events in their own communities. As always, initial reports this year indicate a mixed bag of results. In some cities, especially the smaller ones, turnout was only in the dozens, while other cities saw thousands of demonstrators. In New York City, attendance was on the rise compared to last year's ill-organized march, with an estimated 1-3,000 people participating. And in marked contrast to the term of former Mayor Rudolf Giuliani, police seemed markedly disinclined to arrest anyone. "The march here was a lot better than last year," said Beal. "Last year, we had a confluence of things go wrong -- people who didn't have the march's best interests in mind, publicity materials that didn't work, things like that. This year we had better people involved and we had propaganda that really worked. Our flyer this year was graphically interesting -- it had a person in a wheelchair being attacked by a cop with a club -- and it also had the march route and schedule information. I think that really made a difference," he told DRCNet. "And there were no arrests. This is a complete sea change from the Giuliani era," said Beal. "It took about 18 months for the police to change their attitude. Of course, I went on the radio to tell people it was a protest, not a pot fest, but the cops could have arrested people this year and chose not to do it. The police attitude in earlier years came right from the mayor's office, and Giuliani is just an evil, malicious, sadistic man. Now he's gone, and the attitude has changed." While Million Marijuana Marches took place in dozens of cities across the US, perhaps the highest per capita participation was in Canada, with marches scheduled in dozens of towns across the country. Thousands of people marched in Toronto, hundreds more in Vancouver, and even out of the way places like Lethbridge, Alberta, held events drawing small crowds. Things were a little different in Latin America. While marches in Mexico City (6,000 attendees, according to organizers) and Santiago, Chile, came off with little police interference, Million Marijuana March organizers in Argentina ran into unexpected problems with local authorities, even though they had worked uneventfully with them in earlier years. At the last minute, the mayor of Buenos Aires refused to issue the permit and police came to the scene with orders to seize our equipment if we insisted on putting on the concert and the speeches," said Silvia Inchaurraga of the Argentine Harm Reduction Association (ARDA), the lead organizer of the event. "But thousands of people were already there or on their way, and even though we announced in the media that the festival had been cancelled, we still ended up with about 10,000 people at the site. Even in the face of official intolerance, the Festival Against Intolerance went on," she told DRCNet. And there is another set for Rosario, Argentina's second largest city, this weekend, Inchaurraga said. "Now the biggest Million Marijuana March activity in Argentina will be in Rosario," she told DRCNet. "We have 11 musical groups and we have the authorization of the local government, which is even letting us use an auditorium free of charge." Inchaurraga expects larger crowds than in Buenos Aires, she said. As in New York City, the idea in Argentina is not a pot fest but a protest. For Inchaurraga and ARDA, the May mobilizations are part of a broader effort. "We are seeking to advance the consensus in favor of modifying our drug laws, which penalize the possession of drug for personal use, and to reduce the harm caused by this law," she said. In Brazil, it was not official intolerance but a very ugly social atmosphere that put on a damper on the Rio de Janeiro Million Marijuana March. Violent clashes in the Rio slum of Rocinha two weekends ago that saw drug trafficking gangs fighting each other and the police left a toll of nearly 20 dead and created an atmosphere of intolerance for drug users of any stripe. While the drug legalization group Psicotropicus had organized the previous march and was organizing this year's event, it pulled out in the wake of the Rocinha violence, citing requests from friendly politicians such as Congressman Fernando Gabeira, as well as concerns that the group's reputation could be damaged either by open conflict or by a march that was not successful. But although Psicotropicus pulled out, Rio's pot-smokers were not to be denied. According to reports in the Brazilian press, the demonstration, which took place at Ipanema, was small -- the crowd was estimated at 60 people -- but peaceful. "The march took place even though Psicotropicus withdrew as organizers at the behest of allies like Congressman Gabeira," said Psicotropicus director Luiz Paulo Guanabara. "We wanted to postpone the march, but there is a big marijuana movement in Rio and other cities like Sao Paulo, and the pot-smokers were already looking forward to demonstrating, so they went ahead and did it anyway. It was a spontaneous demonstration, like a carnival," he told DRCNet. "We withdrew because the violence in Rocinha has created a very hostile atmosphere against drug users. And the government is running TV ads that basically say if you use drugs you are supporting the drug terrorists, so the drug users are being accused of being responsible for the drug trafficking-related violence," he explained. Ironically, Brazil is in the midst of a move to substantively reform its drug laws. That is not the case in Sweden, arguably the most prohibitionist of any European country, but while friendly authorities in Brazil urged organizers to cool it, unfriendly authorities in Sweden turned a blind eye to that country's first public pro-marijuana demonstration. Sponsored by the Swedish marijuana reform group Swedish Cannabis Organization (http://www.swecan.org) and featuring the International Anti-Prohibitionist League's Marco Perduca, among other speakers, the Stockholm rally drew about 400 supporters of marijuana legalization. "I would call the rally a significant success," Perduca told DRCNet. 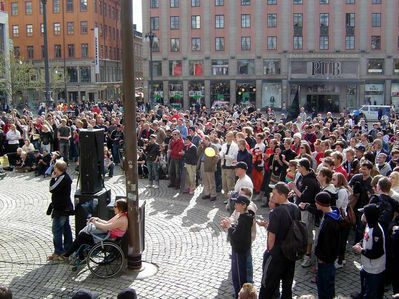 "Hundreds showed up to support the legalization of marijuana in peace and harmony in front of the building where the Nobel prizes are handed out. The police watched attentively, but from a distance," Perduca reported. Arch-prohibitionists the Hassela Nordic Network were present, but not a problem, he said. "There were a couple of dozen anti-marijuana activists with their orange balloons watching," he said. At this date, reports are still coming in from around the world, with the size of demonstrations reflecting not only popular attitudes toward marijuana law reform but also the organizing groundwork that did or did not take place. For instance, small-town Burlington, Vermont, drew more than 1,000 people, while big city Philadelphia could muster only 60 marchers along South Street. Al-Jazeera reported that more than 600 people marched in Capetown, South Africa. Events were scheduled for more than 200 cities worldwide, but with demos stretching across two weekends, there is much, much more to come. Many European capitals will be holding their marches this weekend, Beal said. While the Million Marijuana Marches all have local angles, said Beal, their ultimate goal is global marijuana legalization. "We are working on getting a new international treaty," he said. "If somewhere between 80 and 90 of the countries that are signatories to the UN conventions renounce them, they are no longer in effect. Our ultimate goal is to replace the existing treaty with one that not only recognizes the legality of marijuana but defines marijuana prohibition as genocide. The current UN scheme seeks to wipe out distinct groups who are engaging only in a harmless cultural practice. And by maintaining the prohibition against marijuana, the UN is effectively maintaining the monopoly of alcohol and tobacco -- killer drugs -- over cannabis. Millions will die of disease related to alcohol and tobacco because they cannot switch to marijuana. If that's not genocide, what is?"